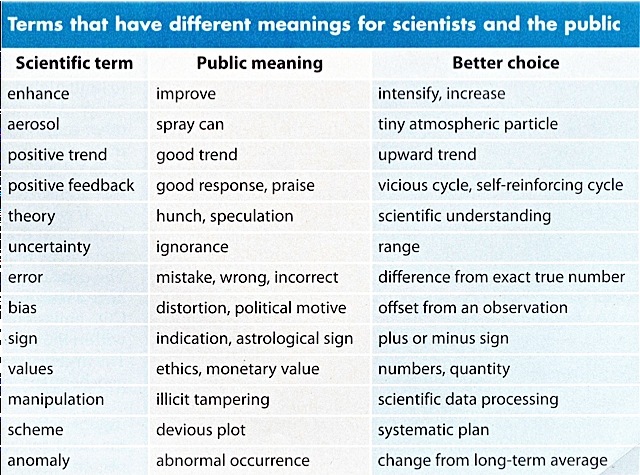 A lot of scientists and science writers I follow online seem to be sharing a table outlining terms which have, apparently, different meanings for scientists and the public, as if it was some sort of incredibly useful resource. Physics Today, October 2011, pp51. It popped up on one of the American Geophysical Union blogs as well as Southern Fried Science who has extended the conversation with a googledoc. Then it got Boing-ed. I think the table has been taken a little out of context, lifted from a pay-walled article in the American Institue of Physics’ magazine, Physics Today. None of the people passing around this table seem to care about the basis for this advice. How did they learn that this was a meaning the public would take from a word? How did they test the ‘better choice’? This sort of questioning was my first reaction to the chart, and frankly I’ve been a bit shocked by the uncritical attitude approach other people have taken to it. So, I dug out the article and although it covers a lot of what might easily be described as probably quite sensible media training advice, that is really all it is. It is based on the experience of the authors, which I’m happy to agree is pretty decent experience, but is still rather partial, not to mention unsystematic. That doesn’t mean the debate prompted by the table hasn’t been useful. I’m not disputing the idea that scientists use different language from other people. But scientists often use different language from one another too, or at least, one specialist will have a different set of terms from another. Moreover, it’s plain silly to assume all members of the public (whatever ‘the public’ is…) take the same meaning in all contexts. To take, for example, the 6th word on that list: ‘uncertainty’ won’t necessarily mean ‘ignorance’ to everyone without scientific training, all of the time. Let’s not be reductive about language, please. I’m all for people reflecting on the multiple meanings of words associated with science, and for people sharing advice and experiences to help come up with a ‘better choice’. By all means think about terms, but let’s not kid ourselves that this is anything other than a bit of useful blah, please don’t take any of this as set in stone and please, please, PLEASE don’t generalise about the whole of science and the whole of the public as some sort of simple and discernible binary. Otherwise I’ll just start stabbing things. As that Physics Today argues (if you read it, not just blogposts…) climate change communication is worth doing well. Precisely because I agree with this, I want to stress that it is important that we keep in mind the specific context of our various utterances on science, and avoid the lure of too-easy generations. Personally, I think we should be investing in detailed and rigorous social science on this issue. Although I do think a bit of general chatter is useful (if you are interested, do go and play with that googledoc), I also think it is worth more than that. It’s worth being clever about this. It’s worth being precise. It’s worth being evidence-based. This entry was posted in science and tagged climate, language, science on October 19, 2011 by alice. You know, there already are scientists who do provide detailed and rigorous evidence for lists like the above. In fact, there is a well established field of study in linguistics that deals with what they call “jargon.” Which is why I disagree that the list above is a useless overgeneralization. For the sole purpose of reminding highly trained professionals to mind their knowledge bias (and avoid using their jargon when communicating with laypeople) it works wonders. This is not to say that scientists were not part of the general population when it came to understanding the jargon of other professions. But then again the latter claim was never the scope of the original article either, was it? I didn’t say it was useless, my point is that it’s not based on the sort of linguistic study you refer to. Also, my point is not to criticise the article, but the out of context way the table was taken (and stress that if you did look at the context, the basis for the table was largely anecdotal). Thanks for tracking down the original article, and you’re absolutely right about the perils of generalisation, of course. I tend to think of this sort of exercise as something to keep in mind rather than rules to follow blindly, but I always find them interesting – if nothing else, they makes me think and make a conscious decision about whether/how to use a certain word. Sorry, that should be “they *make* me think”. I think the ‘trick’ point is really interesting, but I’m not sure it the key social difference in its meaning is simply one way for scientists and one way for the public. It is a really intesting one to flag up though. Re ‘trick’ – when I was trying to write something about climategate over xmas 2009 my son was revising for his A levels in maths. I was ranting around the kitchen, where he had spread out his books, about the whole -gate thing, when he looked up and pointed to the page he was revising, on which he was told to use a certain ‘trick’ to solve one of the math problems in the book. As I am zilch at maths I was quite a amazed by that and relieved at the same time. Just an anecdote, nothing to do with the blog, really. I agree, there needs to be more rigorous linguistic research – one could do a nice corpus linguistic study of ‘uncertainty’ for example (ah another thing to do) – but I also think that these lists are just useful in raising awareness of the different languages we ALL speak and that we have to listen to each other and look at the context and develop a critical awareness of how words are used across domains of human experience and knowledge and how fragile meaning actually is! Comment to my own comments. The problem with the list is that it sort of dichotomises things. What one should really be aware of is polysemy, i.e. the multiplicity and flexbility of meaning…. yes, completely agree – nothing wrong with tables like this as way of sharing advice and discussing the issue – but it isn’t a dichotomy and this particular study isn’t routed in systematic study. Not to go all meta-binary on you all, but isn’t the implied (or imposed) sense of interpreted superiority in the (unknown) scientists’ use of these ‘performative utterances’ in itself rather dichotomous..? Just saying, from my little corner of constructivist ana..
Not quite sure what you mean. I think you mean what Hiltgartner talked about as dominant concern, in which case I largely agree. Certainly, that table has its limits, but scientists who do not regularly communicate about science with non-scientists often have NO IDEA that their words mean different things. As a scientist, it’s somewhat shocking to read through this and say “Oh yeah, the word “bias” DOES have a totally different popular meaning.” That is why this table is getting so much buzz. It’s not because it’s perfect or evidence-based, it’s because reading through it is kind of like getting hit in the face with a bucket of cold water. Even for scientists like me who spend a fair amount of time thinking about these things. Some scientists have no idea, and yes, I don’t think there is anything wrong with this table as a starting point for debate. I totally agree it can be useful. I was prompted to bother ranting on the blog about it when I saw professional journalists posting it as some sort of ‘useful resource’. The uncertainty example is a good example in American English, if not in British English. As for trick, above, that’s an example from British English that doesn’t work in American English. I agree that it’s worth reading the whole article. The first person who blogged this has an audience of AGU members – all of whom receive a print copy at home. However, there is research behind this, and I think the table makes the arguments a lot more concrete. When I start your Feed it seems to be a lot of garbage, is the issue on my part?